As a first part of an upcoming series this month we’ve sat down over coffee with Leigh Sear to find out what’s going on at SFEDI Solutions. So lets get to know about more about Leigh and what his role is within SFEDI is. “I am Chief Executive of SFEDI Solutions which is part of the SFEDI Group. Our value proposition is to make a difference through enterprise learning and skills development. We do this is in different ways including: developing national occupational standards, undertaking applied research projects, creating innovative enterprise learning and skills programmes and enterprise education materials. 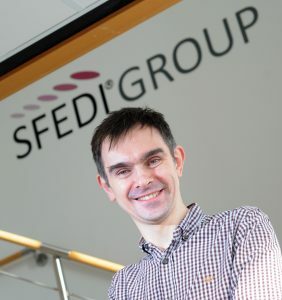 SFEDI Solutions works with a wide array of clients from many different sectors and Leigh often finds himself working on several projects at once. So what projects are currently being undertaken? “I am working on a number of interesting projects at the moment. I am currently writing some learning and skills materials for an Erasmus Plus project (see http://coopinproject.eu/en/) which is exploring how to support businesses and organisations with introducing and implementing social innovation. As part of the project we are creating a series of mini-games for an online educational game – so I am out of my comfort zone somewhat! Skills materials with small businesses and education and training professionals in the green economy (see https://www.green-entrepreneurship.online/). So, if you would like to get involved with the testing please do get in touch! I am also working on the Captured programme with Newcastle University Business School – we are busy recruiting owner-managers of micro-businesses for the next series of workshops which will start in January 2019 (see https://blogs.ncl.ac.uk/captured/). As you can see SFEDI Solutions are involved in a range of interesting projects and we will keep you up to date with developments on these projects. So how does the work of SFEDI Solutions benefit you, our IOEE members? This is what Leigh had to say: “In a number of ways. First, through various Erasmus Plus funded projects we are creating different sets of enterprise learning and skills programmes and materials – members can get involved in the testing of these and/or their roll-out. For example, we are involved with a really interesting project which is developing an enterprise learning and skills programme for migrants and refugees which can be delivered using mobile technologies (see http://learnonthego.eu/en/). We are looking to profile stories in the materials of migrants and refugees who have started their own business and education/training organisations doing something different to support migrants and refugees on the journey from idea to action. Second, as we are working with a range of different organisations across Europe we come across examples of good practice in understanding and supporting different aspects of starting and growing a business. We share these through articles in the IOEE Think Enterprise newsletters. We also asked Leigh, where do you see the future of SFEDI and are there any objectives you’re currently working towards? “It is an interesting time as the enterprise learning and skills landscape is changing dramatically. There is less publicly-funded provision so different organisations, such as large corporates, are entering the market. Also, the way in which enterprise and entrepreneurship education is being delivered is changing – e.g. shifting online, more customer-led programmes etc. This will create a range of opportunities for SFEDI in the near-future to continue to make a difference through enterprise and learning skills development. And finally with so much going on what is it you do in your spare time when you get a moment to yourself? Leigh said “Outside of work, I enjoy time with the family, reading (I’m currently reading Detroit 67 by Stuart Cosgrove which is a great read), listening to music from the 80s and following the mighty Pies (Notts County) and Bears (Chicago Bears in the NFL).